Makenzies Miracle: Weight On... Worry off! Today we all took a field trip to the Children's Hospital. I set my alarm for 7 am and slept right through it.... so did Makenzie! I shot straight up in bed to look at the clock.... it read 9am! CRAP! So there I was scrabbling around trying to get 4 kids out the door in 30 min for our 10am appointment! We managed to make it to the appointment only 10 mins late only to sit in the check in line for another 10 min, then wait in the waiting room for another 10 and in the exam room for another 30 mins before the doctor strolled in. Normaly none of that would have bothered me much but being that is is summer break and all four kids where with me I was a bit irritated with all of the waiting. However the appointment went very well. Makenzie weighed in at 14.5kg or in English about 31 lbs!!! That is a 2 pound weight gain since we visited this doctor 9 weeks ago. Her body mass index or BMI is in the 50th percentile! YEAH GO MAKENZIE! "Nutrition seems excellent at this time. Her BMI is at 50% and she is gaining weight well." The doctor then proceeded to tell me that NO ONE could reasonably say that Makenzie was malnourished! Life is good! God is good! It has been a long 3 months but with God's faithfulness we have won the war! Thank You Jesus. I can't tell you how proud I am of not only Makenzie but of myself as well. (Don't worry my head still fits through the door.) When I pulled Makenzie's G tube it was a decision I felt good about. I knew what I was doing and I also knew what to do if there where any problems. When I dealt with adversity on that decision I waivered a lot. I thought many times about just giving in to what others thought was best for my child. I had many long talks with God and every time the same answer was given... TRUST and BELIEVE... with God ALL things are possible. There was a lot of self talk. I mean really, I know Makenzie better then ANYONE else here on this planet we call earth. I stood strong. 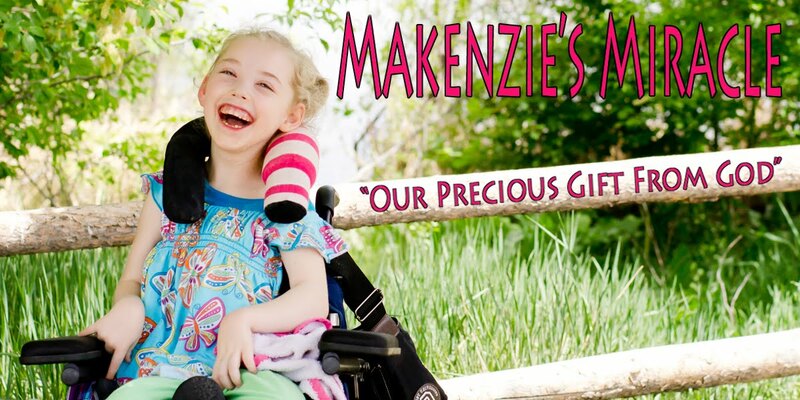 I fought for what I believed and knew about Makenzie and what was best for her. I did it! I trusted and listened to God and today He gave me concrete proof of my faithfullness! Success! Sunday Makenzie will be 5 years old. She is growing. She is healthy. She is happy. She is learning. She will be kindergardener in just over a month. She is a shining light. Makenzie has a mommy who is willing to walk to the ends of this earth if it means she will be all of these things.